With its 9% to 15% productivity advantage over efficient IT, lean IT is the next frontier for CIOs — a steppingstone in their digital transformation journey and a serious fund-raiser for all sorts of digital ambitions. Efficiency is about spending less to get the same, whereas lean is about spending nothing on things that don’t matter. We often use these two terms interchangeably; however, in the context of enterprise IT, the contrast between them is remarkable. Traditional enterprise IT was created to support the business of the industrial era by delivering efficient solutions through economies of scope and scale. Within this context, the trillions of dollars in spending on technology by global enterprises over decades has been governed essentially by two measures: year-over-year (YOY) budget adjustments, and the unit cost of inputs such as the blended rate of IT labor and cost per server. While budgets represent a committed end, the efficient unit cost of inputs is the means to get there, a.k.a. efficient IT. The pursuit of efficient IT brought about numerous innovative management practices — program management offices, outsourcing, offshoring and location arbitrage, centralized management and shared services, to name a few. Through the adoption and enhancement of these practices with a great deal of toil, sweat and tears over decades, enterprise IT leaders achieved a commendable track record in driving their unit costs down. This trend has significantly slowed down in recent years with the commoditization of IT inputs, and further unit cost reduction opportunities have become scarce (Figure 1). Figure 1 - Financial services companies have (mostly) accomplished their efficient IT missions. Industry cases suggest that efficiency savings are more elusive now than ever before due to complexity of execution, risky assumptions and siloed organizational and governance structures (Figure 2). Consequently, efficient IT is a mission (almost) accomplished, a table stakes rather than a source of differentiation, in today’s financial services industry. Figure 2 - Recent industry cases illustrate the increasing difficulty of realizing savings from efficiency levers. In the digital era, the role of enterprise IT is shifting from merely supporting the business to delivering a competitive advantage through economies of agility and technical ingenuity. This shift is creating a number of fundamental conflicts with the scope- and scale-driven efficient IT. At the top of the list sits reliance on the unit cost efficiency of inputs as the primary criterion of the financial success of enterprise IT. The economic model of agility and technical ingenuity thrives with smaller batch sizes -- frequent delivery rather than annual releases, modular architecture rather than one-size-fits-all platforms -- and the iterative development enabled by actionable feedback from customers, providers, systems and the like, rather than plan-driven project execution. These changes will generate exponentially more data about the business outcomes enabled by IT, which are better indicators of the financial success of IT than the proxy use of the unit cost of inputs. 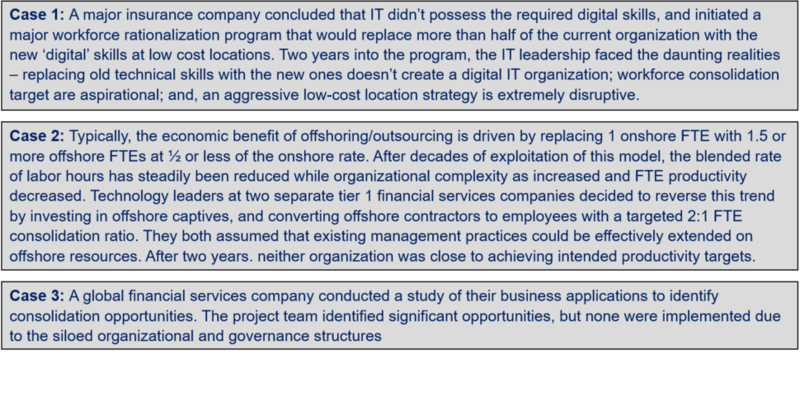 To illustrate this point, let's think about a typical IT cost reduction initiative leveraging offshoring, outsourcing and shared services levers. Almost always, the business case is justified by applying a unit cost reduction assumption to a constant volume of consumption. By focusing on outcomes, enterprise IT will be able to manage the consumption -- rather than the unit cost -- of inputs, which will open up a whole slew of new optimization scenarios for IT managers. Leading CIOs, who are keenly aware of the shifting mandate of their organization and the underlying economic drivers, are already looking beyond the unit cost efficiency of IT. They are mandating their teams to focus on things that matter most to the business, and stop doing things that don’t matter, a.k.a. lean IT. 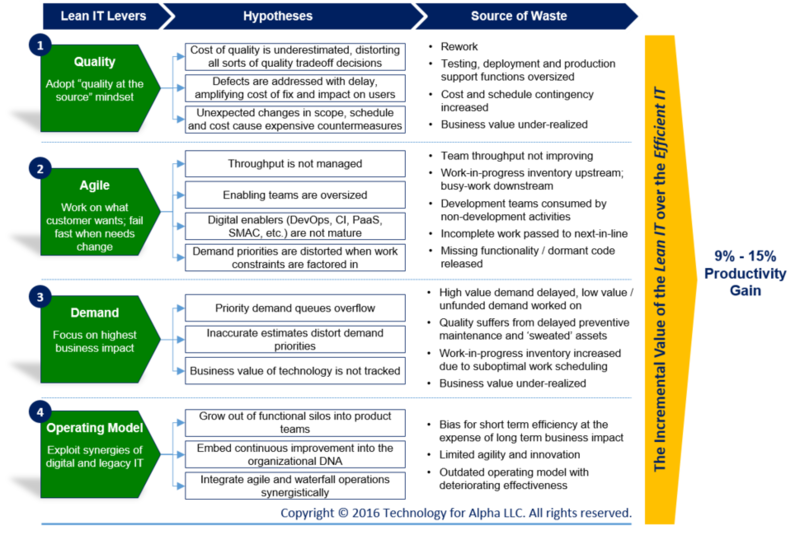 The term lean IT is defined as the extension of lean manufacturing and lean services principles to the development and management of IT products and services, with a central concern of eliminating waste. Defects, rework, low-value work, busywork, slow decision-making, on-site/manual tasks, outdated requirements, partially complete applications, underutilized hardware, bench resources, firefighting, knowledge loss are examples of waste applicable to enterprise IT. Embedding quality into development rather than investing in integration and UAT testing. Knowing how to fail fast when needs change, rather than sticking to the original plan. Continually improving rather than benchmarking. Improving processes and breaking down functional silos rather than throwing more resources on bottlenecks. Portfolio managing, rather than sweating, application and technology assets. Figure 3 - Lean IT is the next frontier for CIOs, and a steppingstone in their digital transformation journies. Quality: Drives value by addressing quality problems at the source. Think about a drop of ink in a swimming pool. With a fast action, the ink can be cleaned up with a single dip of a bucket. If delayed, the ink diffuses throughout the pool and requires the pool water to be replaced entirely. Similarly, defects that stay in the system long enough cause new defects, and a fix becomes exponentially costlier. Agile: Is about embracing change in business needs and being able to fail fast when necessary. A study conducted by the Standish Group discovered that 50% of features developed by enterprise IT are hardly ever used. Most frequent culprits are outdated requirements, aging work-in-progress inventory, and broken feedback loops with customers. Demand: Ensures that the whole organization works on the highest-value tasks. This is more easily said than done. What happens when the mandatory projects budget is exhausted midyear, project estimations are misleading, or the integrity of project priorities is compromised due to scheduling constraints during execution? 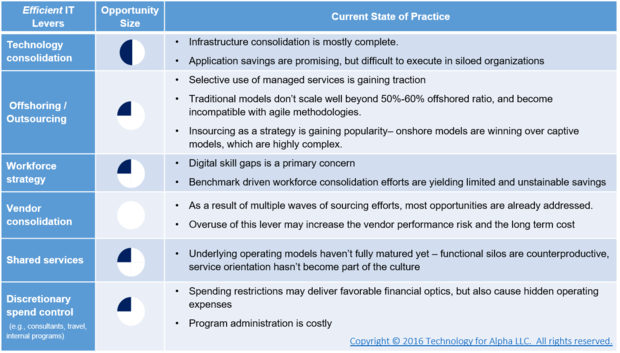 Operating model: Aims for correcting frictions across the overall enterprise IT ecosystem due to organizational misalignments, process bottlenecks, or governance bureaucracies. Although the lean IT concept is not new, it hasn't gotten much traction yet. This is about to change. With a broad adoption of the digital-era operating models, methodologies and technologies, it is now possible to establish a meaningful correlation between the actions taken by enterprise IT and the subsequent business outcomes. Encouraged by these advancements, leading CIOs are already asking their teams to generate funding for digital opportunities through innovations in IT management, and to reorient enterprise IT as a competitive advantage in the digital arms race. Lean IT is potentially a significant source of fresh funding for digital transformation initiatives. CIOs can expect 9% to 15% productivity gain by leading their organizations to leapfrog from being efficient to being lean. This is equivalent to almost doubling the currently available funds for the whole digital initiatives portfolio (Figure 4). Figure 4 - Lean IT productivity gains have the potential to double the available funding for digital transformation initiatives. A well-structured lean IT program could break even in six months and start delivering positive financial results within the first 12 months. The full rate of benefits could be realized within 24 to 36 months with a strong executive support and focused execution.